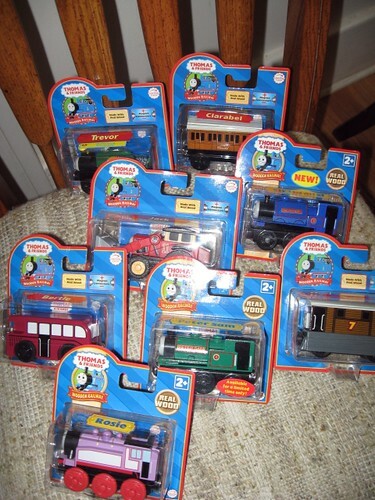 On Friday JL and I both read several different blogs and deal forums that linked up to coupons for a free Thomas the Train car at a major toy store chain. Since JL was home early we packed the boys up and went to the store, each armed with a coupon. They told us that not only could JL and I each get one, each of the boys could as well. So Friday evening we had NHL select four new trains. Saturday after strawberry picking we happened to swing back near another store and decided to stop by to see if any of the Thomas Trains were left. There were, so NHL picked out another four and we left quite content. These trains retail for $10.99 and $12.99 each. Our total would have been $101.04. We paid $7.32 which covered the cost of tax. Not too shabby. The best part is NHL and JSL only had two trains, so now they have ten! Wow, y’all cleaned up! That is awesome. Of course we don’t really NEED anymore trains around our house! YEESH! That is my kind of bargain! So… your good deals might still be coming! That’s an amazing deal!! We go through sooo many Thomas trains at our house. Wow—that is an awesome deal! !